A wine that breaks all expectations, with a complex savoury profile wrapped around a deep fruit core. Elgin’s cool climate contributes to a more mineral and restrained style of Syrah. Add Richard’s extraordinary attention to detail and you have a wine that breaks all expectations, with a complex savoury profile wrapped around a deep fruit core, freshness of flavour with cracked pepper, black cherry and exotic spices, gracefully set on powder fine tannins. The grapes were handpicked under autumnal skies into small lug baskets and then manually sorted on a conveyor before the stems were removed.The destemmed berries fell onto a vibrating table in order to remove jacks and substandard berries before dropping uncrushed into a small 500kg conical hopper and forklifted into open- topped fermenters.The grapes underwent a 3-day maceration before spontaneous fermentation began. A gentle pigeage program was charted and the grapes remained on skins for 21-29 days.The wine was then racked to barrel under gravity and the remaining pomace basket-pressed. Malolactic then proceeded in barrel followed by a light sulphuring and 17-month maturation. No finings were necessary and the wine was simply racked unfiltered prior to bottling. A small number of artisanal coopers were selected from Burgundy and Rhone, with only French oak chosen. 55% of the oak was new with the remainder split into 2nd and 3rd fill barrels of which 4 were 500L puncheons and the remainder 228L pièces. Richard Kershaw Wines was established in 2012 to create world-class, clonally selected, site-specific, cool climate wines. South Africa’s coolest wine district, Elgin Valley, provides the high altitude, ocean proximity, specific cloud cover sequencing, high cold units and large diurnal range which enables the Kershaw Chardonnay and Syrah to demonstrate a sense of place. The climate leans toward Southern Burgundy and the Northern Rhône, prerequisites for using Chardonnay and Syrah, deemed “noble” in that they have the ability to produce world-class examples and show positive development attributes through age. 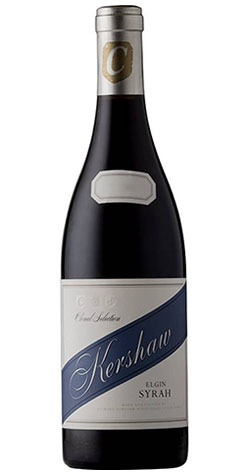 The Kershaw Elgin Chardonnay makes use of the lower-yielding Dijon clones, namely 76, 95, and 96, developed at the University of Burgundy in Dijon, France, while the Kershaw Elgin Syrah utilizes local clones 9c and 22, with each wine made from three to four small parcels on terroir-specific plots with particular soil types. Stylistically, the aim is to faithfully reproduce the particular attributes associated with wines from these areas. In the case of the Chardonnay, the aspiration is for a restrained, mineral style focused on elegance with a white, fruit character, some oatmeal, and complexity gained from percipient wood. For the Syrah, the desire is subtlety and precision built on fine tannins that educe harmony, freshness, and flavors of dark fruit and black pepper. The founder and winemaker, Richard Kershaw, was born and raised in the UK and left a successful career as a chef to pursue his passion for wine. Now an International Master of Wine, Richard is also a widely respected wine writer and judge of wine competitions.